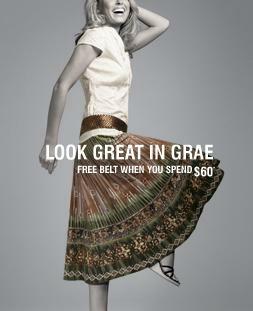 The grass is always greener at Suzanne Grae and to prove it they’re giving you a FREE plaited belt, in bronze or chocolate, when you spend $60.00 or more in any of their stores! Their latest range “Metallic Green” – is also no exception! You’ll find wearable shades of green from fresh apple to khaki and will love the array of fabric textures featured in this dazzling range. Wherever you go, you’ll turn heads in the cotton circle-skirt with stunning gold foil print! Friends will be green with envy when they find out this fabulous skirt only set you back $49.95! To get this great look, team the skirt with their lace-trim cotton shirt for only $39.95 - and their FREE belt in bronze or chocolate (when you spend $60.00)! The new “Metallics” range features flattering, textured smart pants, Victorian-inspired shirts trimmed in lace, long full skirts, tie cardigans and knit tops And naturally, to make mixing and matching simple – their basic tees and singlets also come in a complementary palette of colours! Be seen in green this season - looking great is easy with Suzanne Grae! To locate your nearest Suzanne Grae store, simply log onto the Suzanne Grae website. Please note that the Suzanne Grae 'Free Plaited Belt' offer has expired. To see the latest offers and what's new at Suzanne Grae, please visit the Suzanne Grae website.